The 2015 Honda CBR650F is an interesting motorcycle. Honda says it's meant to fill the gap between the entry-level CBR500R and the hard-edged, supersport CBR600RR. In the past few years, Honda has been focused on enticing and capturing new riders with new entry-level and mid-level motorcycles. As someone who works in the industry, I'm always thankful for efforts to expand ridership because a growing industry is usually followed by companies increasing R&D and coming out with new and interesting stuff. However, with everything from the 125 cc Grom to the user-friendly NC700X, plus three 500s and two 300s in between, I had to wonder: Does Honda really have any more holes to fill in its street lineup? Regardless, I was pretty excited to pick up the new CBR650F from Honda HQ. A 650 cc inline-four with a little fairing and decent ergos, designed for people upgrading from their first bike? Sounds brilliant. The CBR650F uses an all-new 649 cc inline-four, which will form the base for a new line of motorcycles (it's also currently available in the naked CB650F), as Honda has previously done with the 300 cc and 500 cc lines. Honda claims this new motor produces a max output of 86 horsepower at 11,000 rpm and 46 foot-pounds of torque at 8,000 rpm. The 2015 Honda CBR650F. Honda photo. To help lower the center of gravity, Honda engineers canted the cylinders forward 30 degrees, a trick they also used on the Honda NM4. This angle also gives air from the intakes a direct shot through the air cleaner and into the intake ports, which reduces the intake resistance and helps boost power and fuel economy. The bike also features a 16-valve DOHC cylinder head with direct cam actuation and PGM-FI fuel injection with 32 mm throttle bodies. The engine acts as a stressed member of the chassis and is bolted to the diamond-shaped, twin-spar, steel frame using aluminum engine hangers. Honda says the chassis is designed to be stiff around the headstock, while providing a little more flex at the spars. The compact size of the engine allows it to be placed further forward to provide a 50-50 weight distribution between the front and rear axles for better balance. Seat height comes in at 31.9 inches, and the bike has a wet weight of 454 pounds. Front suspension duties are handled by a 41 mm Showa fork that allows for 4.7 inches of travel, but is not adjustable. The rear gets a single shock, which allows for 5 inches of travel and has a seven-step adjustment for spring preload. Dual, wave-type 320 mm discs mated to twin-piston binders provide stopping power up front, while a single-piston caliper grabs a single 240 mm disc at the rear. ABS does not come standard, but is an available option. The CBR650F retails for $8,499, while the CBR650F ABS goes for $8,999. Now, back to that "interesting motorcycle" part. Honda calls the CBR650F a sportbike designed to bridge the gap between the mild-mannered CBR500R twin and the race-replica CBR600RR supersport. To do so, they've given it the ergonomics of a competitor like the Kawasaki Ninja 650, but instead of using a parallel twin, like the Ninja, they've opted for an inline-four, like the CBR600RR. The 2015 Honda CBR650F. Photo by Sean MacDonald. The thing about inline-fours is that they're excellent and incredibly smooth motors, but they typically make their power much higher in the rev range than singles or twins. Normally, this isn't much of an issue, because they're most often used in larger bikes with tons of power, so even the bottom of the rev range still provides plenty of power to satisfy (unless you're one of those macho men who think 600 cc sportbikes are underpowered and only for n00bs). Smaller, more entry-level bikes often use twin-cylinder engines to make the power lower in the rev range, which is easier and more accessible for new riders. All of this is to say, while the CBR650F aims to be the perfect blend of beginner and intermediate on paper, that doesn't quite translate to the street for me. If Honda deserves credit anywhere, it's for the fact that all of their bikes just work. If I seem critical, it's not because the CBR650F is a bad motorcycle. It just seems to me that Honda took an unnecessary swing and missed. The CBR650F does not stray far enough from the CBR500R to really fill the hole it's designed to fill, and it definitely isn't sporty enough to really act as a transition to a CBR600RR. Something like a Triumph Street Triple or Ducati Monster would be a better middle ground for people wanting to go fast, but still have something with accessible around-town power. I spent the better part of a month doing my normal thing on the Honda. Commuting around all of Los Angeles and Orange County, with plenty of time lane splitting down bumpy freeways and playing on twisty roads — but the entire time I just kept asking myself, "Why does thing need to exist, and why now?" Little details like this tidy exhaust really add to the aesthetics of the CBR650F. Photo by Sean MacDonald. So I did what I always do when I need to argue with someone about a bike: I called Lemmy. Despite being a crazy person, he actually had some interesting things to say. Upon my describing the bike to him, he said it sounded like the kind of bike that he would love to ride and it got us thinking. While this bike may not be the best bike to bridge the gap for new riders between their CBR300R or CBR500R and CBR600RR, it would be an excellent bike for the guy who's been riding his whole life and loves to ride the snot out of an inline-four, but doesn't necessarily want to get arrested. We'll call this guy the "mature rider." Not that he's old, necessarily, but just that has both the skill to ride something you have to wind up pretty high and the knowledge that he doesn't need to go 130 mph everywhere. For that guy, this is a wonderful track toy or canyon carver, because it allows him to work on the same riding skills he would with a supersport, just at speeds bordering almost legal. The CBR650F performs just as every other Honda of late: just fine. Handling is completely predictable and downright easy. Everything from turning into a corner to rolling on the throttle on exit happens effortlessly, and the chassis allows for no surprises. The clutch, though not particularly light, feels dead predictable and switching through the gears happens almost without thinking. Manufacturers take note, this is how you do matte black. Photo by Sean MacDonald. The engine is also just fine. Power feels muted until about 7,000 rpm, where it finally kicks in and proves it has the extra ponies over its competitors twin engines. Aesthetically, Honda has done a nice job lately. The matte black paint looks beautiful up close. Much nicer than you would expect from an entry-level bike. The best thing I can say is that, besides thinking the engine is a strange match for the bike and its purpose, I don't have a single complaint with how anything actually performs. The CBR500R is a great bike. The CB500X is a great bike. The NC700X is a great bike. Honda has plenty of great bikes for this customer, and my only real problem with the CBR650F is that I don't see a need for it. Anyone have a tail tidy kit handy? Photo by Sean MacDonald. It's been a long time since I lusted for a Honda and I would love to see the company focus on keeping buyers in the brand once they've attracted them with one of their entry-level bikes. If I'm being completely honest, the CBR650F just bored me. I expected more, given the 86 ponies, and it didn't feel nearly as sporty as I thought it would. The 500s are dull in a way that still makes them fun to play with, but to me, the CBR650F was just a let down. Pricing also feels a little high, given the competition and the buyer Honda is after. For $9,000, you can buy a lot of motorcycle, and this just doesn't feel like it. The instrument cluster looks as if it was pulled straight from the CBR600RR. Photo by Sean MacDonald. The Honda CBR650F has an MSRP of $8,499, while the CBR650F ABS will run you $500 more at $8,999. The Kawasaki Ninja 650R has an MSRP of $7,199 and $7,599 for the non ABS and ABS models. Its about 30 pounds lighter than the Honda and its parallel twin makes 71 horsepower (down 15) and 47 foot-pounds of torque (equal). The Yamaha FZ6R retails for $7,790 and makes 64 horsepower and 38 foot-pounds of torque. It weighs the same as the Ninja, but ABS is not available. I would probably also consider the CBR500R a competitor. With an MSRP of $6,799 for the ABS model, it's a pretty attractive option for people looking for an entry-level and sporty bike. The Honda CBR650F, in a vacuum, is a fine motorcycle. While I don't think it does anything particularly well, it also doesn't do anything poorly. 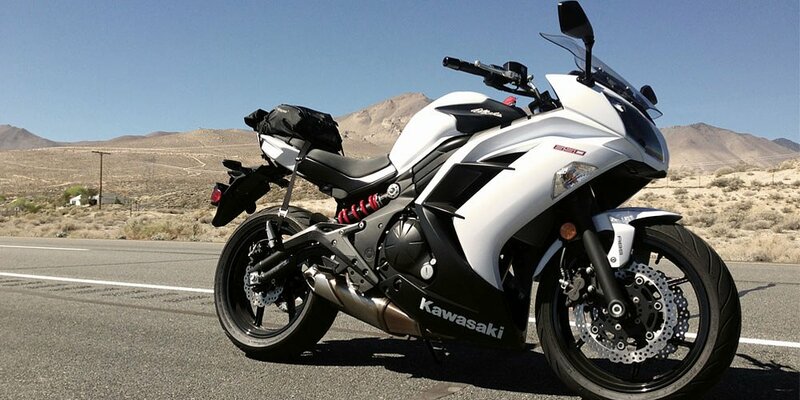 For new riders, however, it simply isn't as appropriate, fun, or economical as options like the Kawasaki Ninja 650R. However, that doesn't mean that people won't buy and love this motorcycle. I would love to see Honda change tactics a bit and aim this at mature riders who want a small displacement inline-four to play with. I would love it if I were wrong and the CBR650F found a niche or became the new Suzuki SV650 and found its way onto the track. But I just don't see a scenario in which I would recommend buying it over something else.